1. Participants complete the assessment. along in the participant guide. Is Conflict ruining your Organization’s productivity? productivity loss can be directly attributed to workplace interpersonal conflict issues. If you have supervisors, staff or other professionals, bickering, competing, sand bagging, being passive-aggressive or generally underperforming, chances are you’ve got significant conflict roadblocks. Learn how to quickly and easily deliver effective conflict resolution interventions, that will provide demonstrable improvements! 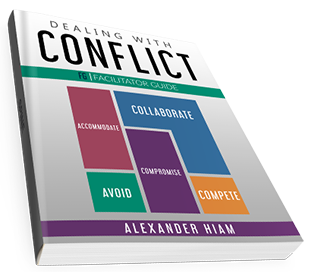 Our newly revamped Dealing with Conflict will help you hit the reset button and get dysfunctional teams back working productively. This easy to use program enables anyone to quickly teach any group paralyzed by conflict, to see new solutions and new ways to move beyond entrenched positions and towards productive solutions. Dealing with Conflict is a complete conflict solution. The assessment works with the facilitator and participant guides and the video provides realistic video examples to help participants learn more effectively how to identify and apply different conflict resolution strategies. License holders will also have access to an entire suite of training resources, making this one of the most effective and complete solutions on the market today.